A surgical technologist is an allied health professional who works closely with members of the surgical team to ensure quality patient care during an operative procedure. 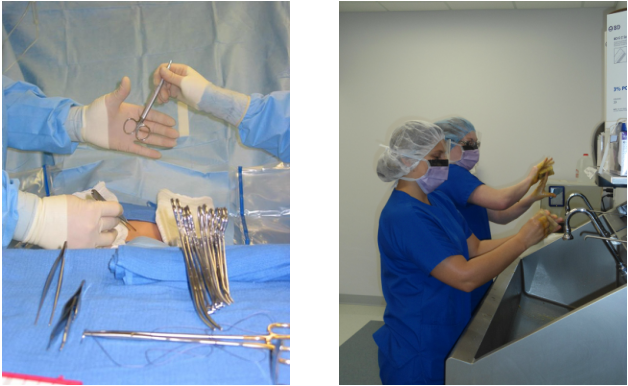 The surgical technologist performs duties in the three areas of surgical case management - pre-operative, intra-operative and post-operative. The surgical technologist is responsible for assisting in the preparation of the operating room for a surgical procedure, preparing the items that will be used during the procedure, handling the instruments, equipment and supplies needed during the surgical procedure, actively participating in the surgical procedure by anticipating the needs of the surgeon, understanding the procedure being performed, constantly monitoring the sterile field to avoid contamination, and assisting in the application of the surgical dressing at the conclusion of the surgical procedure. Surgical Technology is a fast growing profession. Employment for surgical technologists is expected to grow by 30% between 2012 and 2022. Consult the ﻿Bureau of Labor Statistics Occupation Outlook Handbook﻿ for more information or the surgical technology program nearest you.